Here at the Business Resource & Innovation Center, we are lucky to work with some amazing organizations who are dedicated to growing Philadelphia’s small business community. This month, we are excited to highlight the Independence Business Alliance, Greater Philadelphia’s LGBT Chamber of Commerce. We’d like to offer special thanks to Zach Wilcha, IBA’s Executive Director, for answering our questions, as they are just weeks away from celebrating their 10th Anniversary with IBA10! What makes the Independence Business Alliance (IBA) unique in Philadelphia’s business community? We are the official LGBT Chamber of Commerce for Greater Philadelphia, the Independence Business Alliance (IBA) is a membership-based business advocacy organization, dedicated to making the region an influential and diverse LGBT and allied business community with an impact on economic development, business equality, and policy issues. 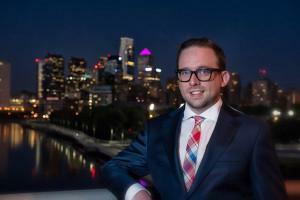 The mission of the Independence Business Alliance is to promote Greater Philadelphia’s LGBT and allied business and leadership communities to enhance financial opportunities, foster diversity, develop leadership and collaboration, and advocate for positive change. The IBA is an official affiliate of the National Gay & Lesbian Chamber of Commerce (NGLCC). Who are your members now and who should join? Our members are businesses owners and professionals from across the Greater Philadelphia area who care about business equality for the LGBT community. Our membership includes lesbian, gay, transgender, bisexual, and LGBT-allied straight folks from three different states in almost any industry you can imagine. Our members are anyone from small, start-up, self-proprietorships to the largest companies in our area. We're very happy that the Free Library of Philadelphia is a member! Anyone who wants to support LGBT business interests should join us for networking and events. What is your favorite IBA event of the year? Anything you’d like to plug? Personally, I love the Holiday Party that we throw every year. Outside of our Business Leaders Luncheon, it tends to be our largest, most well-attended event of the year. My favorite thing about it, is that it brings so many people from our community together to celebrate the past year and lets us look forward to the next. I would LOVE to plug IBA10, our Tenth Anniversary Celebration that's happening at the Down Town Club of Philadelphia on May 10, 2017. It's presented by PNC Bank and will be a night to remember. We'll be looking back at the past 10 years of the IBA and toward a bright future for LGBT business equality. Many people don't realize that LGBT-owned businesses can be certified by a national organization and then be eligible for contracting opportunities with many Fortune 500 companies, and hopefully soon with the City of Philadelphia. I also can't give you all the details, but we have some very exciting first-time programming announcements for projects and collaborations that will be coming very soon! My mom is a librarian, so many of my favorite childhood memories are library-related. I think my favorite was the annual trip to the school where she was the librarian at the end of the school year, and loading up a box of books that I would read all summer long. Finally, what are you currently reading? I try to average a book a week for my yearly reading challenge, so I always have a book or two in progress. I just finished The Last One by Alexandra Oliva last night and picked up More Than This by Patrick Ness this morning. Visit the Independence Business Alliance's site to learn more, or come down to the Business Resource & Innovation Center on June 7 for our "Expand Your Network: A Supplier Diversity Networking Event" to meet their group in person!